Welcome to my review of the Vortex 8×36 Solo R/T Tactical Monocular. Vortex has designed this monocular to be compact and lightweight, providing you with an excellent tool that won’t overburden you or your travel kit. The monocular is 5.3 inches long and 2.3 inches wide, with a hand grip width of two inches. The whole shebang weighs a mere 10.2 ounces. The ranging reticle is designed to give you accurate range estimation for calling shots, but how well does it perform? Let’s take a look, shall we? The accessories are nice and well-made, except for the case. The sides of the case, like that of the Solo 10×25, are made of a cheap elastic that is atypical of what I normally see from Vortex Optics. How Powerful Is the Monocular? With its 36mm objective lens, the Vortex 8×36 Solo R/T provides 8X magnification with a close focus distance of 16.4 feet. That’s a pretty long close focus distance, and I wish it capable of focusing on objects a bit nearer, but this is a compact monocular and can’t be everything for everybody. The field of view through the monocular is a generous 393 feet at 1,000 feet, allowing you to see plenty of the terrain you’re observing. Eye relief is a very comfortable 18mm, allowing for easy use with or without eyeglasses. The eyecup folds up and down for comfortable viewing, and is flared to eliminate stray light, as well as rotatable for a custom fit. I would have rather seen the eyecup twist up and down, since folding models tend to be difficult to adjust properly for different eye reliefs. 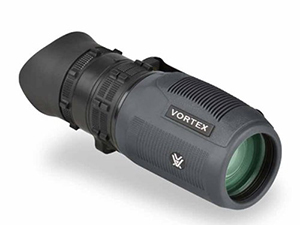 Vortex utilizes a roof prism design on this monocular, which is how it can be so compact. This design also provides for more durability, since roof prisms are more tolerant of abuse than the Porro prism design. 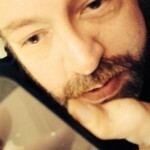 While Vortex doesn’t say it, my own evaluation confirms that this monocular uses BaK–4 prisms. The optics are [fully multi-coated](huntingoptics.net coating), providing excellent light transmission even in low-light conditions. This particular model features both a target image focus wheel and a reticle focus wheel. This is unusual for a monocular, but then again, most monoculars don’t feature a reticle at all. The extra focusing mechanism eliminates the parallax problem and allows you to get the reticle in perfect, crisp focus across all distances. Both focus wheels spin smoothly, but with just enough resistance to prevent you from accidentally moving them. Now, let’s talk about the range finding reticle. This is a hashmarked ranging reticle using MRAD-based subtension lines for determining range, holdover, and windage corrections. There are quick-ranging silhouettes in the bottom right quadrant of the reticle to help you determine range with ease. Make sure you carefully read the owner’s manual to make the most out of this powerful reticle. Vortex has constructed this monocular with rubber armor to provide shock resistance, and it provides a quite secure, non-slip grip. The texturing of the rubber is especially nice and well-implemented. The utility clip is a bit on the chintzy side, unfortunately, but it does the job. Vortex really stands behind their products with their VIP lifetime warranty, and they can afford to do so because they construct products that are rock solid in terms of durability. That’s definitely the case with this monocular, since its rubber armor very handily protects the optic from damage. My only complaint is that the monocular does not come with lens caps, but most size 6 flip caps will fit snugly. Vortex has sealed the lenses with O-rings and nitrogen-purged the optics chamber, so the monocular is both waterproof and fogproof. Image quality is fantastic in all weather conditions, whether it be rain, sleet, or snow. How Well Does the Vortex 8×36 Solo R/T Tactical Monocular Work in the Field? This monocular works wonderfully in the field. The rangefinding reticle has almost replaced my need for a laser rangefinder, and I’ve actually had to use the monocular for ranging instead of my laser rangefinder a couple of times when my batteries died. It worked flawlessly, but you have to invest the time to learn how to properly use it. I’ve used this monocular on several hunting trips, and it’s never let me down. It allows me to spot deer bedded down in brush that my scope alone won’t reveal, and the rangefinding reticle makes it a one-stop shop for finding and ranging the shot before I take it. Thanks for reading my review of the Vortex 8x36 Solo R/T Tactical Monocular. This is an excellent buy, and is quite handy for spotting and calling shots. The only drawbacks are the poorly-designed case, the lack of lens caps, and the flimsy utility clip. I’d still strongly recommend this optic to anybody looking for a tactical monocular.